Metro has revised the scheduled launch dates for the RapidRide E and F lines, allowing time to complete needed construction on facility upgrades and features that will make future service more reliable. Both RapidRide E and F lines previously were scheduled to launch September 2013. Under the new schedule, RapidRide E will begin service in February 2014. 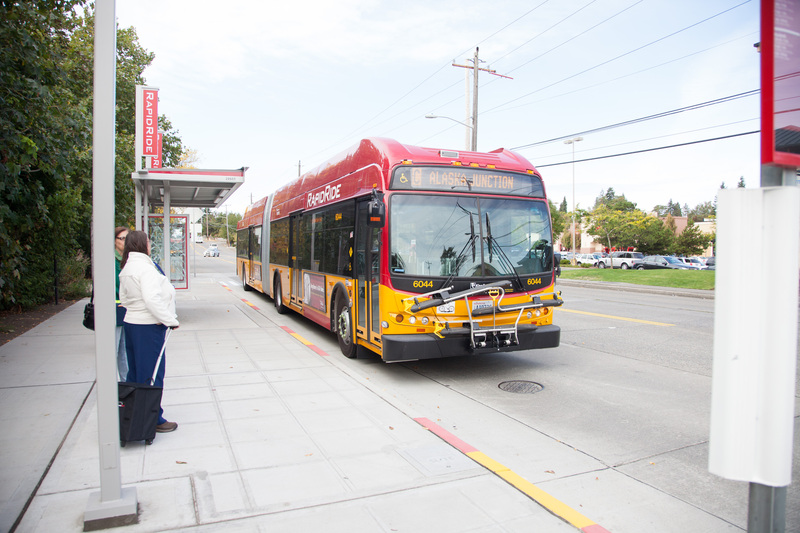 RapidRide F now is slated to launch in June 2014. Before launching service, construction is needed on over 100 bus stops and stations and upgraded transit signals at more than 60 intersections – which stretch across two corridors, 21 miles and six cities. Metro reviewed and revised the construction timelines with cities to reflect the complexity of the work needed to launch service on these two lines. Rider amenities needed before launching the service include next bus arrival signs and ORCA card readers at stations, as well as coordinated traffic signals for buses. Read the full news release. Next Next post: How might Metro’s funding shortfall affect you? Can we get more faster service on 101 at night instead of F line? I would rather see more late runs on 155-156 line between airport and Valley Medical, and more late night runs on 101-169 line(as one route)… or 240-169 line as one bus route between Bellevue and Valley Medical. I mean… line F?! Really? How many people need to travel between parking lots of southcenter and dead Downtown Renton. Every 10 minutes between fred myers of downtown renton and fred meyers of burien?! Who travels by bus to those stores every 10 minutes?! I think we need more service north-south in Renton. most bus lines are split in downtown renton, making traveling through downtown renton a major waste of time. and this line F(the name says it all) is not really gonna help. Just adds more dysfunction to an already dysfunctional route system.